Fancl Changed the formula of their Acne Care line on SS2016. Let me review this for you. Basically, I have no acnes now, but when my period my skin turns to so sensitive, and in Spring- early Autumn, I often get acnes too. In this formula of 2016, I need to admit it is not enough. But for my “problem” parts, especially chin to my face line, it may be better than previous formula. I applied other lotion (Active Conditioning Basic)on my other parts, especially cheeks. When I have acnes, I change my skin care to Fancl Acne Care line, I also use medicines. The purpose of this acne care line is only to stop burning acnes on other places. I know there are some “acne care” cosmetics with strong alcohol. My skin is not tough to use those 🙁 There are no alcohol in this lotion, and this is the reason why I have repeated for more than a decade. I strongly recommend to go to your dermatologist if you have big problem on your skin. This lotion is good, but it is not meaning it erase your acnes. If you have many acnes, you need to be careful. I know some girls who have craters on their skin. Cosmetics may be one of the solutions to PREVENT strong inflammation. If you have strong inflammation, there is one solution, go to dermatologist. 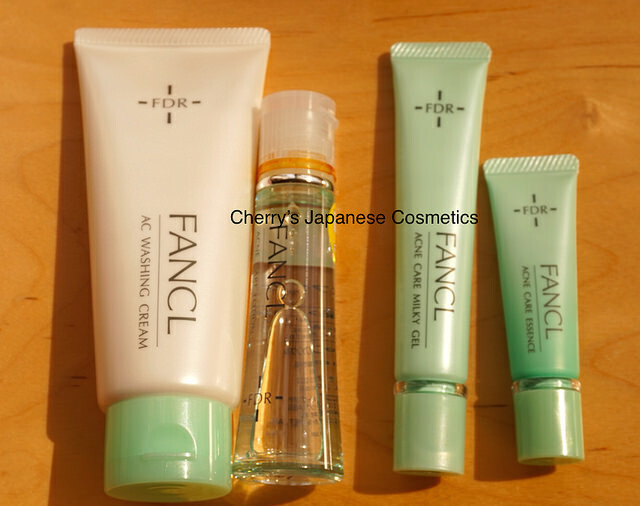 Pingback: Ingredients of Fancl FDR Acne Care Lotion | Cherry's Japanese Cosmetics | We Ship Japanese High Quality Cosmetics as your order.